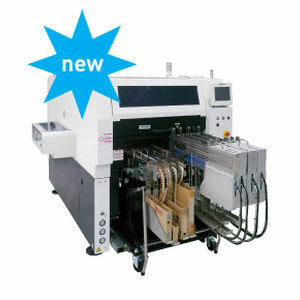 Panasonic designed the NPM-VF odd-form solution to address increasing global labor costs and manual assembly complexity. The new platform, built from the award-winning NPM Platform, introduces several innovative solutions to reduce labor requirements and cost, while boosting productivity, enhancing versatility, and helping ensure quality through-hole and odd-form component insertions. 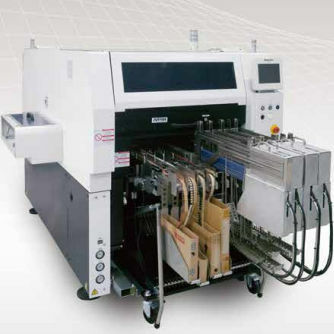 The industry’s only dual-gantry, multi-head, odd-form machine achieves 4500-cph throughput within the machine footprint of a compact SMT mounter. While the NPM-VF handles a gamut of packages with its standard vacuum nozzle, it offers three additional process heads for components up to 130x35mm and 60mm tall, requiring 100N force (nearly 22.5 lbf). Odd-form automation requires more than placement, so the NPM-VF integrates an active, under-board clinch, which traverses the population area. Adopted from Panasonic’s pioneering through-hole technology, the active clinch system can secure various through-hole lead diameters at multiple rotations. Yet, when not required, the clinch doubles as localized board support for snap-in/press-fit components. Panasonic is simplifying odd-form and manual assembly with a solution that helps reduce labor costs, improve quality, and minimize resource challenges.